PINS (AUS) (Bay 1996-Stud 2000). 7 wins-1 at 2, VRC Australian Guineas, Gr.1. Leading NZ Sire (worldwide earnings) twice. Sire of 1081 rnrs, 745 wnrs, 83 SW, inc. El Segundo (MVRC WS Cox P., Gr.1), Ambitious Dragon, Legs, Aerovelocity, Katie Lee, Madison County, Porotene Gem, Econsul, A Touch of Ruby, Antonio Lombardo, Emily Margaret, Mackintosh, Pinmedown, Legless Veuve, Shopaholic, Icepin - Regency King (H.K. ), Rolling Pin, Gallopin, etc. ONESEY, by Fast 'n' Famous. Unraced. Half-sister to SHANDREAM, Doubly Sure. This is her second foal. Her first foal is a 2YO. SHANDREAM (Pins). 8 wins from 1100m to 1600m, NZ$207,310, A$2,400, Counties Bowl, L, ARC Armitage H., BOP RC Morton Estate Sparkling Sprint H., Cambridge JC Presland Tocker Insurance H., ARC Suburban Newspapers Community Trust H., BOP RC Amphora on the Strand H., 2d Hawkes Bay GR Kelt Memorial H., Gr.3, Cambridge JC Mitavite H., Counties RC New Zealand Bloodstock Insurance H., ARC Pegasus Equine H., WRC Gib Premier H., Hawkes Bay Bruce Perry Bloodstock H., Waikato RC Michael Wallace Bloodstock H., 3d ARC Eagle Technology S., Gr.3, Waikato RC Shaw's Wire Ropes Sprint H., L, ARC Fuji Zerox H., Waikato RC Seafood Bazaar H., 4th Counties Bowl H., L.
Doubly Sure (O'Reilly). 7 wins from 1600m to 2600m, A$218,385, SAJC Flight Centre H., Reliance Port Augusta H., Pink Diamond Day H., MRC Marvel Loch H., Fileur H., 2d VRC Andrew Ramsden S., L, SAJC Unity Group H., Penna Michael Accountants H., 3d MVRC City Pacific Finance Balwyn H., Beaurepaires H., Oakbank RC Onkaparinga Cup, SAJC 8 Rar Long Hai Memorial H.
Pinup Coup. 2 wins at 1400m, 1600m in 2017-18, CJC Racecourse Hotel H., 3d WRC Vernon & Vazey Truck Parts H., 4th CJC Warstep S., L.
Safari Magic. 2 wins at 1000m, HK$3,656,000, HKJC Aberdeen H., IWC H., 2d HKJC Yik Yam H., Dumbarton H., Edinburgh H., Siu Sai Wan H., Jupiter H., Precision H., Tsam Chuk Wan H., Begonia H., Birch H., Camellia H., Dundas H., Un Chau H., 3d HKJC Pedder H.
Dashing Saveel. 2 wins at 1600m, 2400m, AJC Emu Plains H., 3d AJC Cartwright H.
Marahau. 2 wins at 1300m, 1400m, ARC Telecom H., 3d ARC Diocesan Sports Foundation H., Waikato RC Iverquantel H. Producer. Night Attire. 5 wins at 900m, 1400m, A$78,475, to 2018-19, 2d SCTC Coolum Getaway Resort P., 3d Ipswich TC Channel Seven H., Gunnedah Burrell Development. H., SCTC Yalumba H.
CATAINER (Centaine). 11 wins-2 at 2-from 900m to 1600m, A$342,110, VATC Zeditave S., L, Schweppes Cup, L, SAJC KPMG S., L, MVRC Sheahan Family Flying H., Wilson Street H., VATC Always Welcome H., Resolute H., BTC Nations 100th Birthday H., 2d VATC Bletchingly S., Gr.3, Sir John Monash S., L, Chubb Security H., Soultine H., MVRC Dynamite Cards H., SAJ Fruit Supply H., 3d VATC Autumn S., Gr.3, Swinburne International H., 4th SAJC Angas Brut S., Gr.2, VATC Japan Racing Association S., L.
Coup Taine (Centaine). 6 wins-1 at 2-at 1000m, 1200m, NZ$126,313, Southland RC James S Mee H., CJC South Island Bloodstock Sale H., Trevino's Bar & Restaurant H., Robbie's Bar & Bistro 2YO H., 2d CJC Queenspark Drive H., Carlton Bar & Restaurant H., South Island Bloodstock Sale H., D & E John Deere H., McCrory Thomas Travel 3YO S., Otago RC Speight's H., 3d Ashburton RC Ray Coupland S., L, CJC Perfect Packaging H., McDuffs World of Golf H., Strut the Stage H., Riccartonpark.co.nz H.
FERCERTAIN (Centaine). 4 wins from 1200m to 1600m, NZ$132,450, WRC Thompson H., Gr.3, CJC Vernon & Vazey Truck Parts H., 2d CJC Millennium Hotels & Resorts H., Manawatu RC Crombie Lockwood H., Noel Eales Memorial H., WRC Zephyr It Can Be a Breeze H., Stella Artois Cavallo Club H., Waikato RC Grosvenor Motor Inn H., 3d WRC Anniversary H., L, ARC Mercedes Prix de Fashion H., Hawkes Bay Humes H., Hutchinson Furnishers Juvenile H.
Lord Asterix (Bahhare). 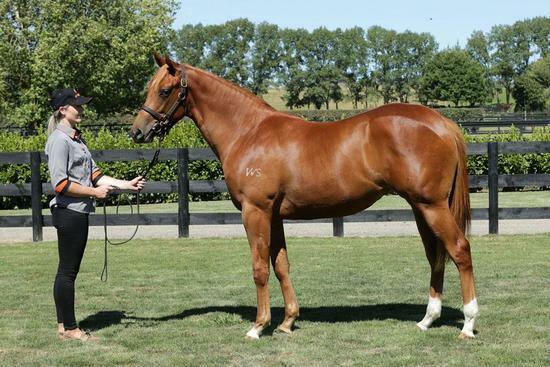 6 wins-1 at 2-from 1000m to 2100m, NZ$108,937, Geraldine Cup, Otago RC Lion Foundation Juvenile H., 2d Marton Cup, L, Feilding Gold Cup, L-twice, WRC Trax Café & Bar H., 3d Hawke's Bay Gold Cup, Gr.2, Counties Cup, Gr.2, CJC Spring Classic H., L, North Canterbury Cup, Waikato RC Hamilton Caterers H., 4th Waikato Gold Cup, Gr.2, Ashburton RC Ray Coupland S., L, Wanganui S., L.